The Americans with Disabilities Act (ADA) provides Wheelchair Ramp Specification, code and handicap access guidelines that most businesses are required to meet. And we here at Ideal Shield are here to help business owners and facility managers comply with the rules. ADA Standards Require a 1:12 ramp slope ratio which equals 4.8 degrees slope or one foot of wheelchair ramp for each inch of rise. For instance, a 30-inch rise requires a 30-foot handicap wheelchair ramp. ADA Guidelines Require a Minimum 5′ x 5′ Flat, unobstructed area at the top and bottom of the ramp. ADA Standards Require wheelchair ramps to have a Minimum width of 36 inches of clear space across the wheelchair ramp. Massachusetts and California ADA code now require 48-inches ramp width to be ADA Compliant. ADA Code Compliance Require a Minimum Turn Platform size of 5′ x 5′. California ADA ramp code now requires a minimum 6-foot (in the direction of travel) platform size. Contact your local building inspector for additional ADA code compliance information. 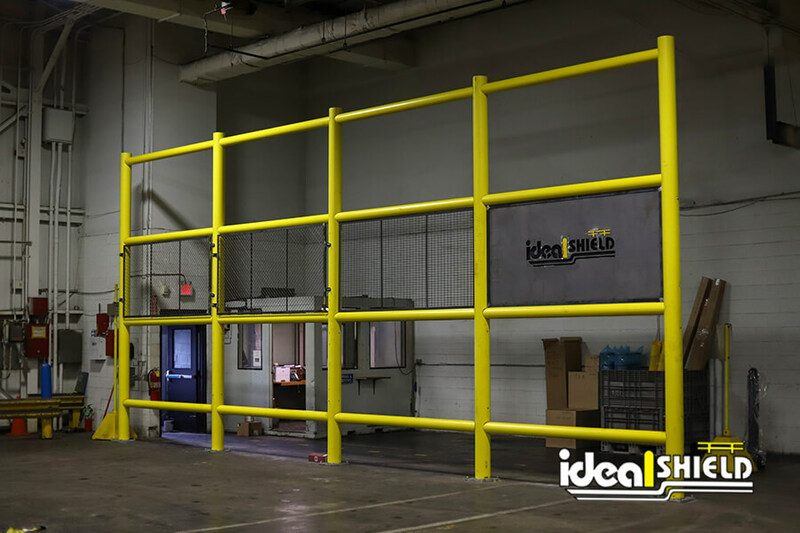 If you’re in the market for an ADA friendly handrail for your business or facility’s wheelchair ramp, please contact us today at Ideal Shield.